The present study is focused on developing structural solid surface geometry to improve heat transfer by cooling of air with transpiration cooling. Effects of flow rate of water (ṁwater= 0.000083, 0.000116, 0.000166, 0.000249 kg/s) and particle diameter of porous plate (Dp= 40, 50, 100, 200 μm) on local wall temperature and cooling efficiency of porous plate and the system inside a rectangular channel with air as a hot gas stream and water as a coolant were investigated experimentally. High performance polyethylene as a porous media was used not only to form a thermal barrier but also an active cooling plate by evaporating water from the surface of porous media to cool air. Temperatures were measured by T-type thermocouples. Two electric heaters were used to support enough power to the system. It was observed that increasing water flow rate did not cause a prominent decrease on surface temperature and cooling efficiency of porous plate. The higher injection rates result in further increase of the cooling effectiveness. Cooling efficiency of porous plate changed from 38 to 90 %. Increasing water flow rate as a coolant causes a prominent increase on cooling efficiency of the system. Increasing water flow rate three times causes an increase of 26.4 % on cooling efficiency of the system. Decreasing particle diameter causes a significant decrease on surface temperature. Difference of cooling efficiency of porous plate from Dp=40 to Dp=200 μm decreases from 12% to 2 % from inlet region to end of porous plate.
.	P.X.,Jiang, L.Yu, J.G.Sun, J.Wang, “Experimental and numerical investigation of convection heat transfer in transpiration cooling”, Applied Thermal Engineering, vol.24, pp.1271-1289, 2004.
.	Y.Q.Liu, P.X. Jiang,.S.S. Jin, J.G. Sun, “Transpiration cooling of a nose cone by various foreign gases”, Int. Journal of Heat and Mass Transfer, vol.53 , pp.5364-5372, 2010.
.	Y.Q. Liu, P.X. Jiang, Y.B. Xiong, Y.P. Wang, “Experimental and numerical investigation of transpiration for sintered porous flat plates”, Applied Thermal Engineering, vol.50, pp.997-1007, 2013.
.	M. Arai, T. Suidzu, “Porous ceramic coating for transpiration cooling of gas turbine blade”, J.Thermal Spray Technology, vol.22, pp.690-698, 2012.
.	F. He, J. Wang, L. Xu, X. Wang, “Modeling and simulation of transpiration cooling with phase change”, Applied Thermal Engineering, vol.58, pp.173-180, 2013.
.	J. Wang, L. Zhao, X. Wang, J. Ma, J. Lin, “An experimental investigation on transpiration cooling of wedge shaped nose cone with liquid coolant”, Int.J.Heat and Mass Transfer, vol.75, pp.442-449, 2014.
.	G. Tsai, Y.C. Lin, H.W. Wang, Y.F. Lin, Y.C Su., T.J. Yang, “Cooling transient in a sudden-expansion channel with varied rates of wall transpiration”, Int.J.Heat and Mass Transfer, vol.52, pp.5990-5999, 2009.
.	T. Langener, J. Wolserdorf, M. Selzer, H. Hald, “Experimental investigations cooling applied to C/C material”, Int.J. Thermal Science, vol.54, pp. 70-81, 2012.
.	Y.Y Tsai, C.H. Lee, “Experimental study of evaporative heat transfer in sintered powder structure at low superheat levels”, Experimental Thermal and Fluid Science, vol.52,pp.230-238, 2014. [10.] Y.Y Tsai, C.H. Lee, “Effect of sintered structural parameters on reducing the superheat level in heat pipe evaporators”, Int.J.Thermal Science, vol.76, 225-234, 2014.
. S. He, Z. Guan, H Gurgenci., K. Hooman, Y. Lu, A.M. Alkhedhair, “Experimental study of film media used for evaporative pre-cooling air”, Energy Conversion and Management, vol.87, pp.874-884, 2014.
. A.F. Mills, Mass Transfer, University of Los Angeles California, USA, 2001.
. R.J.Moffat, “Describing the uncertainties in experimental results”, Experimental Fluid Science, vol. 1, pp.3-17, 1998.
. R.J.Moffat, “Using uncertainty analysis in the planning of an experiment”, ASME Journal of Fluid Engineering, vol.107, pp.173-178, 1985.
. O.Caggese, G.Gnaegi, G.Hannema, A.Terzis, P.Ott, “Experimental and numerical investigation of a fully confined impingement round jet”, International Journal of Heat and Mass Transfer, vol. 21, pp.156-163, 2000.
. S.Fechter, A.Terzis, P.Otto, B.Weigand, J.V.Wolfersdorf, M.Cochet, “Experimental and numerical investigation of narrow impingement cooling channels”, International Journal of Heat and Mass Transfer, vol. 67, pp.1208-1219, 2013. ISNAD KILIC, Mustafa . "Enhancing Heat Transfer from a Porous Plate with Transpiration Cooling". 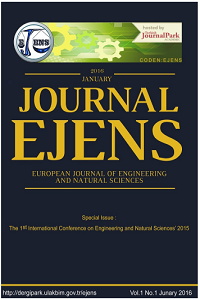 European Journal of Engineering and Natural Sciences 2 / 1 (February 2017): 12-20.